Since writing the above we now have a website much enhanced by Jean-Pierre de Chazal making it easy to look up “The Genealogy” (section 3 refers). I attach an extract from the first couple of pages that covers the subject of that intangible “de”. I would also urge you, as The Family expands, to advise Tristan of any births, marriages or death so that the “Dictionaire” may remain a reliable and useful document. Group or individual photos will enhance the text. The book will take us to the l’île de France towards the second half of the XVIIIth century, with François de Chazal de La Genesté, Councillor to the supreme council (conseiller au Conseil supérieur) of the l’île de France, who died childless in 1796: together with his younger brother Antoine-Régis de Chazal de Chamarel, late Captain of the Provence Regiment, who died in Port Louis in 1772, leaving two sons, the elder of whom continued the line.. 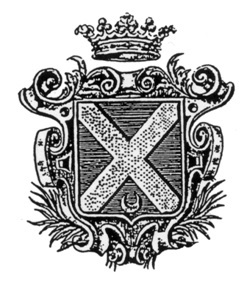 This family, originating in the Forez region, was ennobled in the person of Jean Chazal, son of another Jean Chazal and Marie Valezy, who obtained in 1657, the post of Capitaine-Châtelaini having succeeded him in this position, and in addition having been elected a King’s Councillor in the Forez electoral region, kept this nobility and in his turn passed it on to his son who also fully earned this distinction. From this time the title became hereditary and transmittable to his heirs. One should not be surprised that the CHAZAL family waited until the middle of the century to take on the indefinite article. XVIIIth of Marcilly-le-Chastel. His son, Jean Baptiste Chazal. In France, the article « de » or « du » preceding a name has never been proof of nobility, but more or less an indication of being a landowner. (Code de la Noblesse Française ou Précis de législation, par un ancien magistrat. Paris 1858, p. 184). In effect, gentlemen possessing fiefdoms, above all the family eldest, took after their given name, and often by itself, the name of the family estate. This use having become in general the custom, it followed that the “de” in front of a proper name would be accepted as a sign of nobility, but this was not always the case. As proof, here is this simple statement: Jean Racine was noble whereas in no way was Jean de Lafontaine. At the time that the two de Chazal brothers set off for the Île de France and their elder brother, Pierre de Chazal, was joining the Cour des Aidesii used. They only conformed to the usage, as did the majority of their contemporaries, by preceding their name with the article. Certain writers have confused the family de Chazal with other families from the Auverne and Bourbon, who also carry the name “Chazal”. It is not impossible, that in the mists of time, connections could have existed between those families and the one that concerns us here, but no document gives us the slightest evidence in regard to his hypothesis. Original documentation consists of the family archives; those held in the depths of the Diana at Montbrison, and those recovered from the Departmental archives of The Loire. These establish without doubt that the family ‘de Chazal’ is altogether distinct from its namesakes, acknowledging as its founder Jean Chazal, the first “Jean” of that surname, deputy King’s Tax Collector in the Royal Domain (châtellenie royale) of Marcilly-le-Chastel in 1624. In 1652 he was living with his wife Marie Valezy, on the land that he owned in the commune of Saint-Bonnet-le- Courreau. 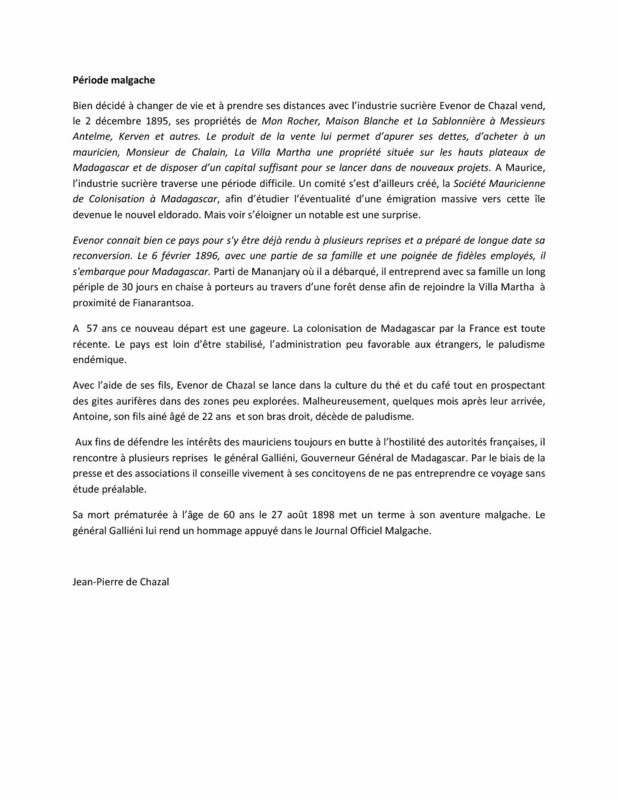 This family, that has numerous members in Mauritius, died out in France at the beginning of the last century, with Pierre de Chazal who had been Councillor at the Cour des Aides (Conseiller à la Cour des Aides) and Member of the Grand Council (Doyen du Grand Conseil). He died in his chateau of “La Sablonnière”, in the Department of Loiret. Louise de Chazal his adopted daughter and daughter of Antoine-Régis de Chazal de Chamarel then wrote to her two brothers who were in Mauritius; “Alas you will never again see your dignified relative, the only one left in France”. This quite clearly shows that neither in secondary line nor in direct line, does there exist any other ‘de Chazal’ in France, and that it was left to those in Mauritius to keep the name alive. The genealogy of the family, based purely on the civic records of The State has besides, confirmed this statement. So, the only de Chazal in the world still living are all directly descended through the male line from Antoine-Régis de Chazal de Chamarel. In the ancient county of Forez, at about twenty kilometres from Montbrison, close to the village of Saint-Bonnet-le-Courreau, there is a small hamlet made up of a farm and a few houses called Roffin, and occasionally named Raufin on old maps. It is from this land that the House of Chazal originated; whose rise was rapid because of the distinguished service rendered by them though the legal profession.